The oldest document referring to the settlement of “Aemstelredamme” (‘dam on the river Amstel’), what is now Amsterdam, is dated on this date in 1275 CE. According to this document the inhabitants of the village were, exempted from paying a bridge toll in the County of Holland by order of Count Floris V. Some people now take this to be something like the date of the founding of Amsterdam: it is not. The origins of the city lie at least in the 12th century, when fishermen living along the banks of the River Amstel built a bridge across the waterway near the Ij, which at the time was a large saltwater inlet. Wooden locks under the bridge served as a dam protecting the village from the rising waters of the Ij, which often flooded the early settlement. The mouth of the river Amstel, where the Damrak is now, formed a natural harbor, which became important for trading-exchange from the larger koggeships into the smaller ships that sailed the merchandise deeper into the hinterland. But settlements on this location are considerably older according to recent archeological evidence. During the construction of the Metro “Noord-Zuid lijn” between 2005 and 2012 archeologists discovered, 30 meters below street level, pole-axes, a stone hammer and some pottery, all dating from the Neolithic era. This means that Amsterdam or its predecessor was occupied from about 2600 BCE onwards although not necessarily continuously. In 1204, the inhabitants of Kennemer invaded the first aggrem Aemestel, the castle at the Amstel dike, thus resulting in the destruction of the house of Gijsbrecht van Aemstel, who, by name of the Bishop of Utrecht, ruled the area. 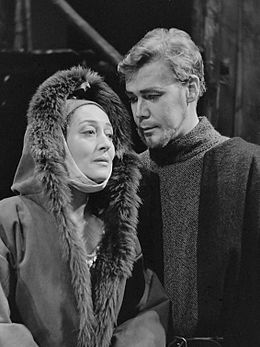 This event was later used by the Dutch poet Joost van den Vondel to write a historical play, the Gijsbrecht van Aemstel, which since then has been staged every first week of the new year. A hundred years later (1304), his descendent, Gijsbrecht van Aemstel VI, tried to claim his alleged rights over the Amsterdam regions, but ended up with his family banished to Flanders. A more important year in the history of Amsterdam was 1275. While Aemstelland fell under the administrative jurisdiction of the Prince-bishop’s Sticht Utrecht, Count Floris V of Holland -the hindland of Aemstelland, granted traders, sailors and fishermen exemption from tolls. 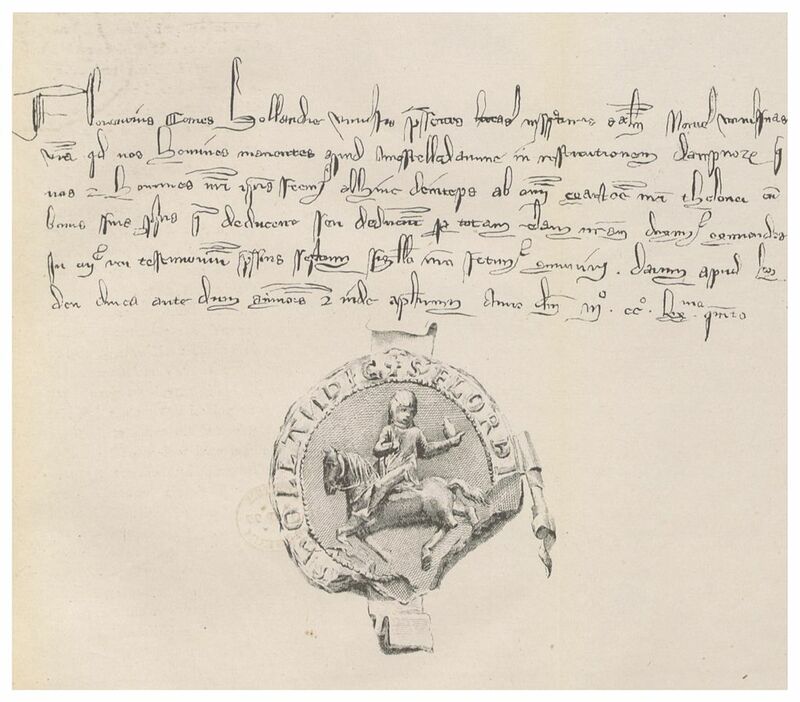 This document, dated October 27, 1275, is the oldest recorded usage of the name “Aemstelredamme” – Amsterdam. This meant the inhabitants from the vicinity of Aemstelredamme acquired a right to travel freely through the County of Holland without having to pay tolls at bridges, locks and dams. This was the very start of the later richness of the young evolving city: by not having to pay tolls, traders could sell merchandise, shipped to Aemstelredamme harbor from everywhere (Scandinavia, Denmark, Germany), at more competitive prices in Amsterdam and the hinterland. After the murder of Count Floris V in 1296, Amstelland again belonged to the Sticht. By 1327, the name had developed into Aemsterdam. In 1306, Gwijde van Henegouwen, bishop of Utrecht, gave Amsterdam city rights. After his death (1317), Count Willem III inherited the Aemstelland, whereby Amsterdam fell under the County of Holland. In 1323, Willem III established a toll on the trade of beer from Hamburg. The contacts laid through the beer trade formed the basis for subsequent trade with cities of the Hanseatic league in the Baltic Sea, from where during the 14th and 15th centuries the Amsterdammers increasingly acquired grain and timber. In 1342, Count Willem IV awarded the city “Groot Privilege”, which greatly strengthened the position of the city. During the 15th century, Amsterdam became the granary of the northern low countries and the most important trading city in Holland. According to legend, on 16 March 1345, the miracle of Amsterdam occurred and Amsterdam became an important pilgrimage town. The Miracle of the Host was a Eucharistic miracle which involved a dying man vomiting upon being given the Holy Sacrament and last rites. The Host was then, due to liturgical regulations, put in the fire, but miraculously remained intact and could be retrieved from the ashes the following day. This miracle was quickly recognized by the municipality of Amsterdam and the bishop of Utrecht, and a large pilgrimage chapel, the Heilige Stede (“Holy Site”) was built where the house had stood, and the Heiligeweg (“Holy Way”) as the major pilgrimage route to it. Subsequently a Stille Omgang (“Silent Walk” or circumambulation) was performed annually to commemorate the event. 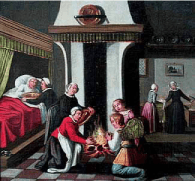 The Stille Omgang fell out of an individual practice during the 17th century as a result of the Protestant Reformation, but was revived in 1881, imitating the medieval procession for the Miracle. During the 1950’s up to 90,000 Catholics, from all over the Netherlands, walked the Silent Walk, but nowadays usually about 5,000 people take part in it, following Mass in one of Amsterdam’s churches. Two great fires swept through the city in 1421 and 1452. After the second, when three-quarters of the city were destroyed, Emperor Charles decreed that new houses were to be built from stone. 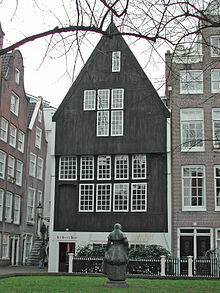 Few wooden buildings remain from this period, a notable example being the Houten Huis (Wooden House) at the Begijnhof. 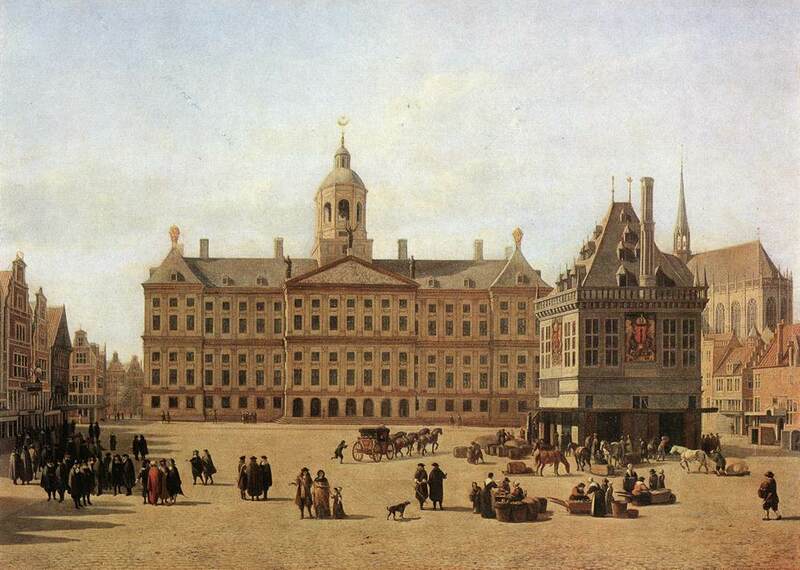 The period 1585-1672 is generally thought of as Amsterdam’s Golden Age. Ships from the city sailed to North America, Indonesia, Brazil and Africa and formed the basis of a worldwide trading network. Amsterdam’s merchants financed expeditions to the four corners of the world and they acquired the overseas possessions which formed the seeds of the later Dutch colonies. Rembrandt painted in this century, and the city expanded greatly around its canals during this time. Amsterdam was the most important point for the transshipment of goods in Europe and it was the leading financial center of the world until it was taken over by London. Dutch cooking benefited from the far-flung colonies, notable Indonesia, much as English cooking was enhanced by the Indian raj. However, I don’t consider chicken tikka masala to be an English dish despite its popularity, nor would I label bami goreng as Dutch even though you’ll find it on most lists of “classic Dutch cuisine.” To be fair, Indonesian recipes have been popular in the Netherlands for centuries, and the Dutch East India Company was responsible for a huge influx of spices into Europe from the 17th century onwards. Nevertheless, I’m purist enough to want to keep Indonesian cooking and Dutch cooking distinct, inasmuch as one can. 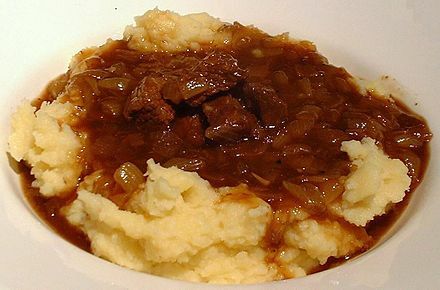 Therefore, I am going to turn to hachee – a traditional Dutch beef and onion stew of venerable pedigree – as my recipe du jour. Its “secret” is in the fact that it is precisely half and half beef and onions (and the spice blend, of course). Melt the butter in a Dutch oven or heavy-bottomed pot with a lid over medium-high heat. Pat the beef as dry as you can with paper towels, and then brown it on all sides working in batches. Transfer the browned cubes to a plate with a slotted spoon and set aside. Add the onions to the pot, plus a little more butter if needed, and cook until thoroughly golden but not deep brown. This step takes much longer than the standard recipes tell you. It may take 30 minutes or longer, stirring regularly with a wooden spoon. When the onions are caramelized, add the flour and stir to combine. Add the beef back to the pot and just cover with beef stock. Add the seasonings and red wine vinegar. Bring the stew to a boil, then reduce the heat to very low, cover, and simmer for 2½ hours. Check to make sure that the beef is in shreds at this point. Then uncover and simmer for another 30 minutes to thicken the sauce. Check the seasonings adding more red wine vinegar to taste if you wish. Hachee is always served with mashed potatoes and sometimes braised red cabbage (with apples).